There is always one question that is asked of little children while they are growing up: “What do you want to be when you grow up?” Sometimes the answers are comical and sometimes they just mimic what their parents already do. I remember even at a young age, I just wanted to help people. It’s amazing that when you are a young child, you set a vision in your mind of where you want your life to go when you’re older. I never strayed from my vision. I started thinking of all the possibilities there were to help people in this world. I considered being a teacher, a police officer, and many other things before I decided that I could best help people by preaching the gospel. Once you accomplish that vision, where do you set your sights next? Many churches around the world sing the old Irish folk hymn, Be Thou My Vision. The significance of the first line of this song often goes unnoticed because it’s the title and the main “tagline” of the song: “Be Thou my vision, O Lord of my heart.” To me, this is the greatest line in the entire song. So many people want to know the purpose of their lives. So many people don’t know where to set their sights for life. The Lord should be our vision. Kids seem to know exactly what they want to do when they grow up. How come adults can’t have the same motivation and passion as young children? All of us are probably already grown up. You may have a successful career, a spouse, and a few kids. Where is your vision? Where do you want your life to go? Where do you want to lead your family? Set your eyes on Jesus Christ. The Hebrew writer likens our spiritual lives to a race. He said that we should “lay aside every weight, and the sin which so easily entangles us, and let us run the race that is set before us, looking unto Jesus” (Hebrews 12:1-2). Have you ever seen a sprinter run the entire race with his eyes focused on the ground? The sprinter won’t get very far if he’s not looking straight ahead, especially if he was a hurdler. But a sprinter focuses his eyes on the finish line. Where are our eyes looking in our race of life? Are we looking at the ground? Are we looking back on our past? Or are we looking forward to Jesus? Satan has, and will continue, to throw hurdles in our way. Satan will do whatever it takes to get your eyes off of Jesus and onto the temptations of this world. Keep looking up! Don’t ever look away from Jesus. When your eyes are focused on Jesus, your heart will be also. Did you notice that the first line in the song doesn’t stop with, “Be Thou my vision”? It’s not just our vision being fixed on Jesus that will help us during our race of life, but it’s when we put Jesus into our hearts that we are setting ourselves up for success. When giving the children of Israel the Law, God told them to “fix these words of Mine in your hearts and mind” (Deut. 11:18). God is our finish line in our race of life. 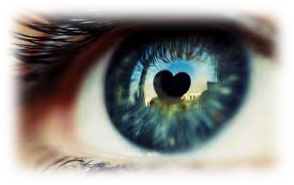 It’s one thing to set your eyes and your vision on God, but where is your heart? Olympic athletes train for years to compete for one month. Their vision and their hearts are set on winning. It’s amazing to witness a trained Olympic athlete fail in their sport. When sprinters fall inches from the finish line, they don’t get up, dust themselves off and say, “Oh well, there’s always next year.” Instead they crumble to the ground with tears running down their face. They have put their heart and soul into competing for the prize of first place. How seriously are we taking our spiritual lives? Are we putting our entire heart and soul into running the race that is before us? When asked what the greatest command was, Jesus replied, “Love the Lord your God with all your heart and with all your soul and with all your strength and with all your mind” (Luke 10:27). God deserves our complete allegiance and our complete dedication. God should be our vision and our strength. He should be our refuge and our comforter. God should be who we are striving towards and who we are striving to be like. God deserves our commitment. God’s law and commandments should be set in our hearts. God’s vision was to spend eternity with His people. However sin separated us from God. God’s vision was crushed when Adam and Eve left the Garden of Eden. Now it’s up to us. It’s up to us to set our eyes upon Jesus. It’s up to us to lay aside every weight and the sin that so easily entangles us. It’s up to us to run the race with endurance. Paul would say that we should run our race, “in such a way that you may obtain the prize” (1 Cor. 9:24). God is our prize. Heaven is waiting for us. Don’t ever lose your vision on God. Set Him in your heart and run the race that you may obtain the prize.